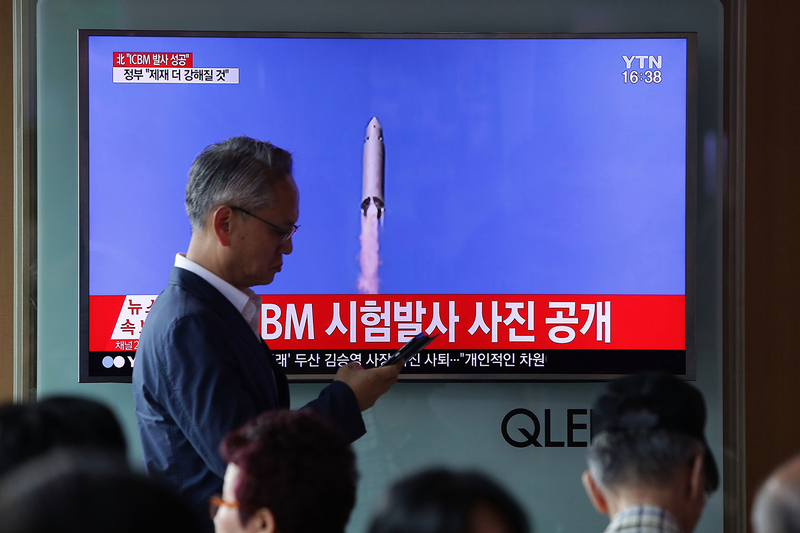 A photo of a North Korean intercontinental ballistic missile test released by the North Korean Central News Agency shown on a television at the railway station in Seoul, South Korea, July 4, 2017. Despite widespread international condemnation of North Korea’s recent intercontinental ballistic missile (ICBM) test, strategic distrust and misperceptions continue to impede deeper cooperation between the United States and China on the nuclear issue. In this podcast, Paul Haenle sat down with Evans Revere, Senior Director at Albright Stonebridge Group and former Principal Deputy Assistant Secretary of State for East Asian and Pacific Affairs, to discuss the recent North Korean ICBM test and how the United States and China can respond to enhance regional security. Revere says that over the 48 years he has worked with the Chinese on North Korea, they have never been willing to do as much as U.S. administrations would like. Beijing continues to prioritize stability over denuclearization, and its version of a worst-case scenario is a collapse of the regime that could bring instability to its border and bring about the loss of its strategic buffer between U.S. forces on the Peninsula. Revere argues that President Trump should continue to pressure China and proceed with his policy of “maximum pressure,” but provide an exit ramp for Pyongyang to return to negotiations. Officials from the United States and China should also sit down with South Korean and Japanese counterparts to discuss a path to a non-nuclear, peaceably reunified Korean peninsula.